Having one of our violent coin envelopes is like running through a meadow of flowers. This bright and vibrant shade of purple will remind you of that beautiful bouquet your significant other sent you, or the one that you sent them! Hey, you could probably use this coin envelope to cover your note on your next bouquet! With this beautiful shade, you won’t ever lose it! Even at the most cluttered desk you’ll be able to find it easily. The small 3.125 x 5.5 coin envelope is the perfect size to store your coins, jewelry, stamps, and more! Don’t let small yet valuable items get hidden under the bed or lost in the couch, use our coin envelopes for fun and safe storage! 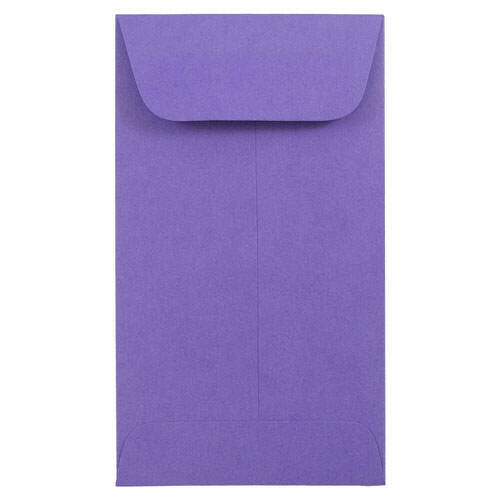 Brite Hue Violet #5 1/2 Coin Envelopes measure in at 3 1/8 x 5 1/2 inches. They open on the short side of the envelope and are 30% recycled!